Laupre | I’ve lost my scissors… again. I’m posting those pictures at http://lauprepicaday.wordpress.com/ so feel free to take a look at random things I see from day to day if you’re so inclined. But I’m keeping my head up. Before I know it it will be sunny and time to make spring stuff! I had this dress hanging in my closet, and I loved the print on the fabric, but the something about the length just bothered me. It fell to a place somewhere between the knee and ankle that just felt awkward to me. Hemming up a dress to make it a little shorter is not a difficult task so I decided to make it a little more interesting by following the bottom edges of the print to make it a scalloped hem. You can see the original hem at the top left here. Next I clipped the fabric from the fold up to the point between each scallop all the way around the skirt. I cut as close to the stitching line as I could without cutting the thread. The last steps were to turn the scallops out the right way, press the seams, and finally stitch the hem. I simply trimmed off the original hem fabric close to the scallops and did a simple machine blind hem stitch. In the end I’m much happier with the length, and I think the scalloped edge just adds a fun touch that works with the spirit of the dress. It has a fun, flowy skirt with an interesting uneven hem. I was working without a pattern and freehanded some shapes to see how it would look in a skirt. The back is made of three pieces shaped like in the image above. The front is a modified half circle skirt shape with the edges cut to match the pieces along the back. If I had had more of the fabric I would have liked to continue the pieces from the back of the skirt across the front. In the end, though, I’m happy with it because I think the simplicity of the front of the skirt balances well with the tied front detail. Yesterday I whipped up this simple top after seeing people wearing similar ones around town. I thought they looked comfortable and the design is so simple I thought it would be a great project for summer sewing. I know I’m not the only one who gets busy and begins to neglect their sewing space when the weather gets nice! It ended up being just a twenty minute project, and it’s as easy to wear as it was to make. There is no need for a pattern as it was as simple as three pieces, and since I used a knit that’s pretty stable and not prone to unraveling I just left the neckline and sleeve holes unfinished. I just wanted to add an update post on the Lace skirt I was working on last time. It came out exactly as I had hoped. I finished the top with a stretch knit waistband for comfort and added a bow made from the same material as the lining fabric. It came together really quick and evenly with the lace evenly basted to the lining fabric. It’s very girly and fun, and with the full circle skirt/lots of gathered lace combo it is too hard to resist twirling! Gathering by hand, to me, is one of those tedious tasks that I usually can’t stand. Today though, I’m taking the time and gathering this lace onto the lining fabric of this skirt I’m working on. The underskirt is a basic circle skirt. I don’t know if this is a “real” technique or not, (I know there are easier ways, but I like doing it this way when I’m feeling like a perfectionist) I use two needles and two lengths of thread to gather and secure the fabric. First I pin off the sections evenly distributing the length of the gathered material in relation to the base. Then little section by little section I use one needle to gather, pull the thread tight, and secure with a couple knots at the end of the section. I use the second needle and thread to whipstitch over the top, securing the gathered stitches to the base. Now when I go to add the waistband I won’t have to worry about the gathering ending up uneven or bunched in areas. With a different fabric I might not mind, but I think with this lace the unevenness would probably disappoint me later. The rest of the skirt should come together really quickly, so I can enjoy spending a little more time on this one detail. It is officially done! I even finished it on time , it just took me a few days waiting on the weather to be able to get decent pictures. It’s just as snuggly and comfy as I hoped it would be! My sewing table is covered in squares! I finished hand quilting the last square for my black and white quilt last night at craft night, so today I begin the process of putting the last half of the quilt together. Spurred on by the encouragement of the lovely ladies and gentlemen at the spot, I’m motivated to get this done this week. This has been by far the longest time I’ve ever spent on a single project. By this time next week I can finally avoid all those eyerolls and “Finish it already!”s, and just snuggle up under this baby. hot iron, hot coffee and a nice big playlist of music? Check! It’s the final Post for my first ever Me-Made-March! 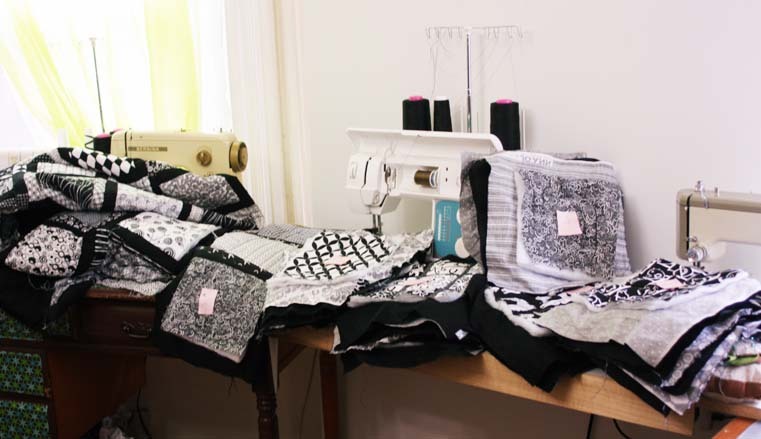 I’m posting late this week because it has just been hectic for me and I’ve been spend any and all moments when I could be blogging working on this black and white quilt tutorial. I don’t know why, but it is just being such a difficult tutorial to put together. I’ve retaken photos dozens of times, trying to make the process as clear as possible. My words aren’t coming out very smoothly either. I’ve spent a couple hours writing at it, but it’s still not done. Anyway, I suppose I’ll set that aside and finish out my outfits for the end of the month! I was told this outfit was a bit “super hero”, but I felt a little like caution tape. The bright yellow dress is one I made last summer that unfortunatly isn’t too flattering around the waist. I threw it on with this new hoodie I made, though, and was really happy to have that bright burst of yellow. It was sad to have a dress in such a vibrant color and a knit that feels amazing and not be able to wear it much because it distorted in the wash. I wish I had thought to just cover up the bad part with a hoodie sooner, bright yellow is just the thing to fight rainy grey Portland winters! I loved this outfit. You can see I’m wearing my cropped sweatshirt/hoodie/shrug thing again. The pale yellow with the white and black was just the contrast I needed to add a little punch to my day! I’ve worn the yellow and white top once or twice before, but I never put it with black before. Me made: yellow and white faux wrap dress, white layered ruffles knit skirt, leggings, cropped swearshirt. The purple top here is a repeat from March 1st, but I wore the top with a different skirt, added a black lacy cami underneath and my cashmere shrug on top. 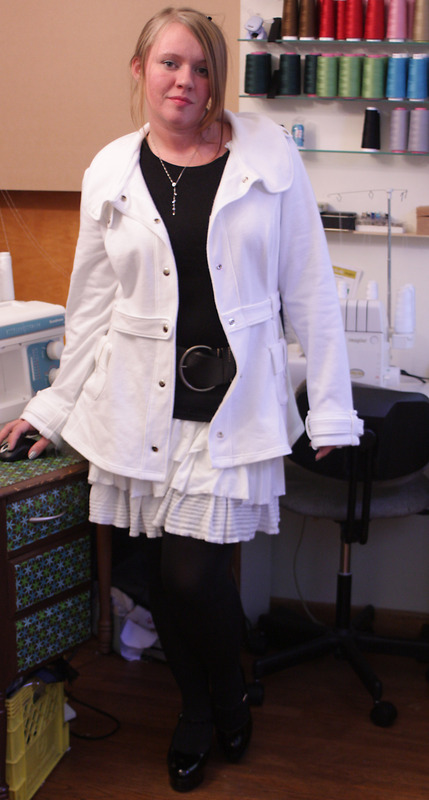 Also, I pulled out this wool coat I reconstructed (but actually haven’t finished) last fall. It has sat in the back of the closet all winter since it’s just not warm enough for cold weather. I had to resize the sleeves, I added the black wool to the shoulders and black, and I’m in the process of swapping out all the plastic buttons for self fabric covered buttons. Since the purple in the coat nearly perfectly matched the purple in the top I thought it was a fun combination. My new pants! I finally got these put together and sewed the snaps for the waistband in so I could wear them. I made these without a pattern, just by drafting, copying a pair of rtw jeans, and fitting and pinning and trial and error! I’m super happy with how the fly came together, and I added some nice pockets to the knees just for a little something different. Pajama day! I wore my pajamas all day around the house, but I’ll be honest, I threw on purchased jeans and a hoodie with my me made ribbed tank that evening to go out to crafty night down the street. Same outfit at March 10th, except with a different skirt. This skirt is an awesome stretch wool fabric I bought at a PDX Sewing circle swap and sale. It’s a dark plaid with shades of purple and grey that seem to go really well with my green sweater. Three weeks down and so far I feel pretty good about my Me made wardrobe! My goals for this week is to finish my blue knit dress that I’ve been talking about (I’ve started and fit the top portion, I just need to assemble, cut and make the skirt part, and insert a side zip).It’s also time to dig a little deeper into the closet and see if I have anything a little older or something I’ve forgotten to wear. I know I have a few pieces that haven’t gotten a chance to be featured in my me-made-march parade, so hopefully I can get them worn next week. My one other goal is to whip up a couple more basic longsleeve tees so that I won’t feel tempted to resort to my store bought ones. It’s a simple project, and I know I can knock one out in an hour, I just need to make myself do it. And finally, either today, or at least early this week I need to finish my tutorial on how I’m quilting and putting together the black and white quilt I’ve been working on at crafty meetups for over a year!